You can support the Navy SEAL Foundation by making a credit card contribution online. Making a donation through our registered secure server is fast and easy, and you will receive an acknowledgement for your tax records. 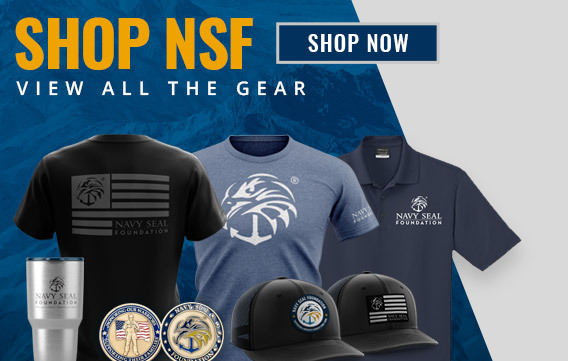 You can support the Navy SEAL Foundation by making a PayPal contribution online. Like our registered secure server, PayPal is fast and easy, and you will receive an acknowledgement for your tax records. Click here to use your PayPal account. On your cell phone in the text function, enter 90999 in the address box. Then, in the message box, enter SEAL and press send. A one-time $10 charge will be added to your wireless bill. Many charitable planned giving options are available to you. You can make a planned gift to Navy SEAL Foundation by naming it as a beneficiary of your last will and testament, life insurance policy, retirement plan, or charitable trust. Some of these planned giving strategies may have a greater tax benefit to you than others, so please consult with your attorney or financial advisor on which strategy would work best for you. If you, your attorney or financial advisor has any questions, please contact Jennifer Bragaw atJBragaw@navySEALfoundation.org. Example bequest language is available by clicking here. Your broker can assist you in making a gift of securities via a direct transfer to the Navy SEAL Foundation. Giving a gift of stock may provide greater tax benefits than giving cash. Your charitable income tax deduction is equal to the fair market value of the stock and you avoid paying the capital gains tax on the increased value. You may also save the cost of brokerage fees because you’re transferring ownership rather than selling the stock. Specific instructions for transferring gifts of securities is available by clicking here. For any questions, please contact Jennifer Bragaw at JBragaw@navySEALfoundation.org. Many employers will match your personal donation and you can increase your donation with employer matching funds. Check with your company for more information on matching gift programs. Employer matching gifts may also be available to you if you are the spouse of an employee, a retired employee or the spouse/widow/widower. Federal employees will find the Navy SEAL Foundation listed as an option in the Combined Federal Campaign (CFC). Please locate Navy SEAL Foundation in the Alpha index or the federation index. Our CFC number is 11454.